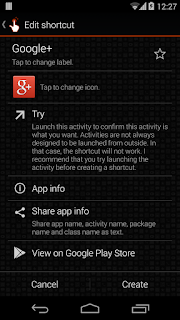 This app can create a shortcut to an application from the list of activities which are installed on your phone. Even if so many applications are installed, you can choose an activity smoothly. You can also use the QuickShortcutMaker for searching the app which you want to launch. If you want to use the app which you don't use frequently, maybe you have no shortcuts for it. 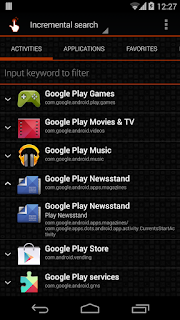 So, you may have to search the app from a list of many apps. Even if you know the name of the app, it's hard to find it. In this situation, the QuickShortcutMaker will help you finding the app. Please try! This may be useful. But please use it at your own risk! You can make shortcuts to hidden setting screens which are usually not accessible. Even if you encountered any problems using this app or shortcuts created by this app, I don't have any responsibility about that. Please be sure to use this app at your own risk. From the version 2.0.1, for a more rapid improvement of the app, you will be requested an additional permission to access network so that the app can send a detailed error report to developer. The app uses network only to send error reports. And when it communicates, a confirmation message will be displayed, so please rest assured. 1. Long-tap the home screen. 3. Long-tap "Activities" which has the QuickShortcutMaker's icon. 4. Drag it to somewhere on the screen. 5. QuickShortcutMaker will be launched. 6. Select an activity, edit it, and tap "Create". 7. A shortcut will be created on the home screen. - Added Italian and Arabic translations. 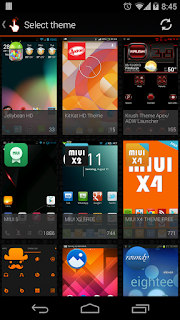 - Adapted to AndroidPhone7 theme. 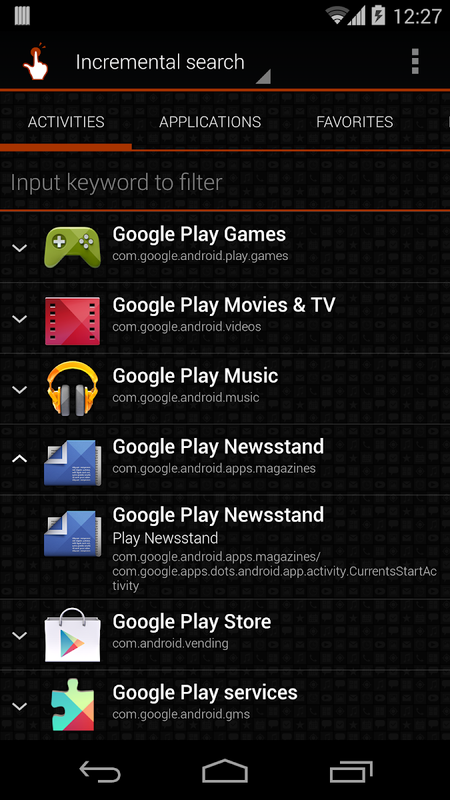 - Fixed a bug that the shortcut for Google Play cannot be opened. - Added several other improvements. 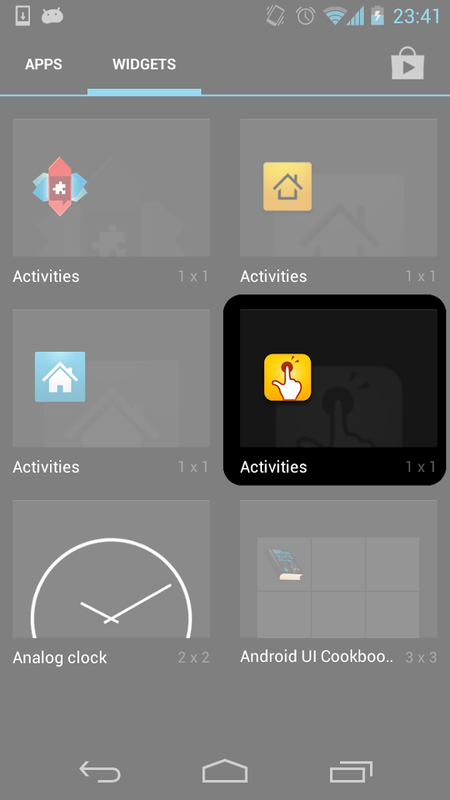 - It is now possible to operate multiple items from the activity list by long-tapping the items. You can add them to favorites or share. - Changed the text format in which to share the application information. 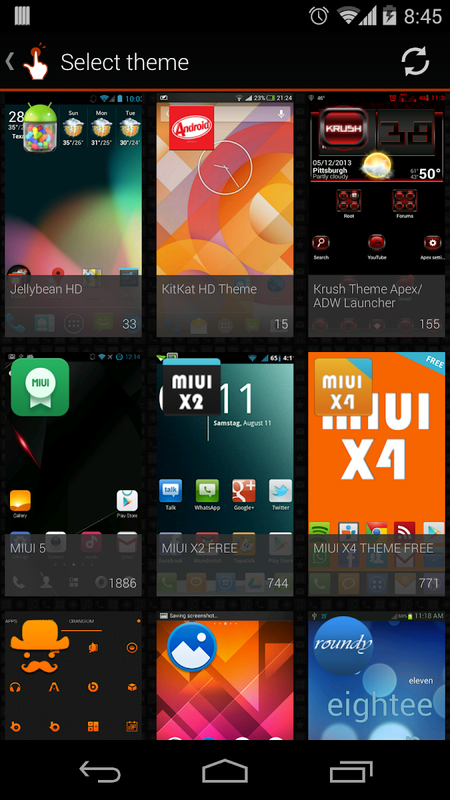 - Added the types of themes that can be selected icon (ADW / Nova / Apex / LauncherPro / GO / Holo). - Added the number of icons in the list of themes. - Changed the UI of shortcut editing screen. - Added a lot of improvements. - Added support for tablet devices. 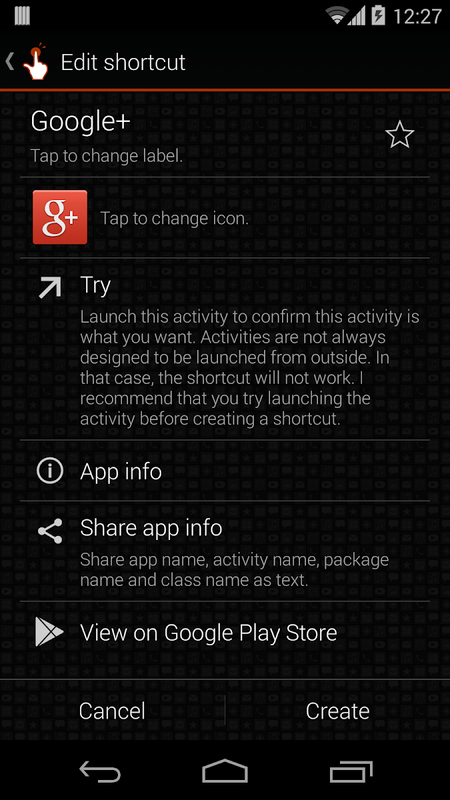 - Added function to share app information as text. - Improved UI of some screens. - Fixed a minor bug and UI. - Fixed a bug that the app crashes while searching at a certain condition. - Added error report function to send detailed information when the app crashes or when you see "Failed to load" message. - Reduced consumption of the memory so that the models which have low-memory not to crash. - Search results can be sorted order by names. - Increased speed of search. - Fixed a bug on setting icon. - Fixed a bug that the icon becomes smaller when you use the app on tablets. 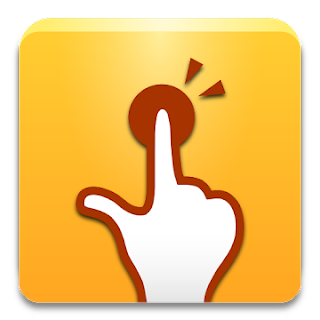 - Added history and favorite features. 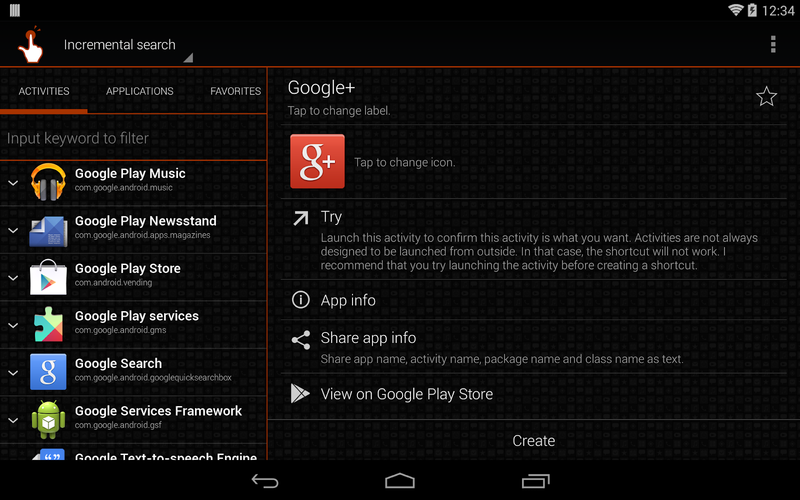 - Applied Android 4.0(ICS) UI style. 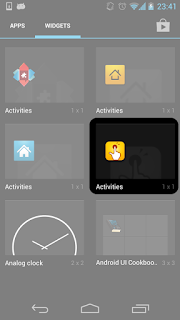 - Activity list is now grouped by app.